Click image to enlarge and download high resolution copy. My inspiration to visit Pailin was threefold. I wanted to visit a local waterfall, see the mountains, and visit a resort I saw in a local tourist magazine. During my two day, one night trip I was able to do all three. First up was Phnom Kieu (Blue Mountain) waterfall. There my travel companions and I swam in the pools of the multi-stage falls and had lunch at a small restaurant overlooking the main stage. From the waterfall we headed through Pailin town to the Memoria Palace resort on the other side. The stand-alone wood and concrete bungalows of the resort are nestled in a small valley with the resort's pool set on a hill to one side. From the pool there was a 180 degree view of the surrounding tree covered mountains. Waking up the following morning was a very unique experience for me in Cambodia. What made it so unique was that it was completely silent. There was the absence of the daily Cambodian grind that I have grown accustomed to for the past year and a half. 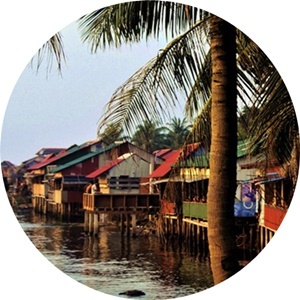 It was a truly relaxing experience in Cambodia. The town of Pailin itself can be a pleasant place to walk around, especially in the evening. Unlike places like Sisophon and Pursat, Pailin is not really on the way to anywhere, so it is not your typical road town. The roads are paved, so it not your hot, dusty market town either. There are hardly any vehicles; Pailin can be really sleepy. The triangular layout of the small town makes it easy to get around on foot. The town used to be chock-a-block with gem shops. It was, and still is, possible to buy an inexpensive ruby or sapphire of low quality for under $10. It’s a good tourist souvenir. You can have it mounted on a ring or pendant and show your friends your Pailin gemstone. The other obvious feature of Pailin town is the abundance of beautiful hardwood furniture. The cheapest guesthouse or eatery has heavy chairs and tables which would cost hundreds of dollars on the international market. You can buy small varnished statues of Beng and Kranhoung wood, bearing in mind that a beautiful forest tree had to fall in order to make your statue. At night, the roundabout area near the otter statue is home to food and drink stalls. During the boom years there were rides for kids and a generally loud, festive atmosphere, but now it is just a peaceful place to have a fruit shake or a beer under the stars. In the right season, sellers roast corn on the cob and coat it with a coconut-butter sauce that is really delicious. 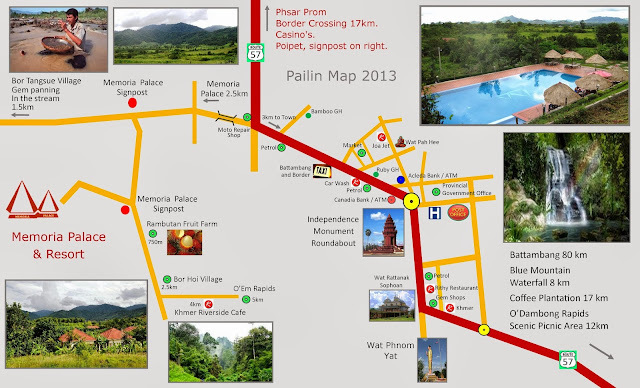 Any tour of Pailin must include Phnom Yat, the hill and pagoda complex at the Battambang end of town. Because of the legend of Yiey Yat, people go to the shrine of Yiey Yat on her sacred mountain to ask her to help them find riches. You might say that Yiey Yat is the patron saint of gemstone miners. There is a statue of Yiey Yat at the shrine, along with a statue of the magic otter. In fact, there are a lot of interesting statues on Phnom Yat, notably the scenes from Buddhist hell, which include liars having their tongues pulled out, and adulterers impaled on a thorn tree. There is an old stupa at the top behind everything else. This is the burial place of the ashes of Rattanak Sambat, the father of another Cambodian literary figure named Khum Niery. This true story was written up in the novel Pailin Rose by Nheck Tem. In the story, Chao Chet, a poor orphan who came to work for Rattanak Sambat, fell in love with Sambat’s daughter. But the father wanted her to marry the governor of Sangker District (east of Battambang) named Balatt. The car broke down on the way back to Pailin, and they were attacked by a robber. Balatt proved to be a coward and hid under the car, while Chao Chet was the hero and saved the day. As a result, Rattanak allowed Chao Chet to marry Khum Niery. The formerly well-paved streets of Pailin have become potholed and most of the town looks pretty shabby. The sole exception is the government area. The roads down past the newly constructed government buildings are in good shape. There is nothing much to see down that way, though, except the big old Russian gun down past the hospital. People call the gun ‘125’. It still has a shell in it. Pailin is known for its mountain and forest scenery, especially its waterfalls. When I first went to Pailin in 2000 and asked about waterfalls, a guide took me up the mountain on a very small trail. We cut through the forest over the mountain and came to a lovely waterfall in the middle of the forest. In 2001, when more tourists were coming to the area, I returned to Pailin and learned that tourists could visit a waterfall out past the Phsar Thmey, sometimes called the Mittapheap Market, three kilometers west of town. A guide took me by moto to the left of the main road. We jagged right through a fruit orchard, and then left again up the mountain. When the road deteriorated off a hard right, we walked straight along a 4-5 kilometre track that curls around behind a mountain into a lost jungle valley. The first part of the walk is uninteresting, but as you enter the valley, there are fine views of the rain forest across the stream. The slope is gradual and the walking is easy, but after a half-hour of constant climbing you can work up a sweat. There are all sorts of bird calls that I could not identify, although the birds don’t show themselves much in the forest. There are no tigers or other dangerous animals here, but snakes are common. I almost stepped on a small cobra, but no one seemed to get excited about it. They just shooed it away, without bashing it to smithereens as most people around the world would do. There are also very large pythons here. As proof, I saw one in a cage at a filling station on the road out of town. It had been captured very near the path on which we were walking. Finally, we left the path after a rickety bridge and scrambled up the rocky stream bed for another 10-15 minutes before reaching the pools at the base of the several falls. They are ideal for just sitting, immersed up to your neck, and listening to the sounds of the rippling water and the birds in the surrounding forest. The water is very cold, but it is refreshing after the walk up the mountain. It is very clear and clean, coming off the uninhabited mountain. The entire journey from Pailin took about 5 hours, but you could spend more time wandering about the falls area. Apparently this is not a heavily mined area, but I wouldn’t stray too far from the path. The jungle is also a malarial zone. You should cover up and bring repellant, but we didn’t see any mosquitoes during the day. Anyway, they say that malarial mosquitoes feed at night. 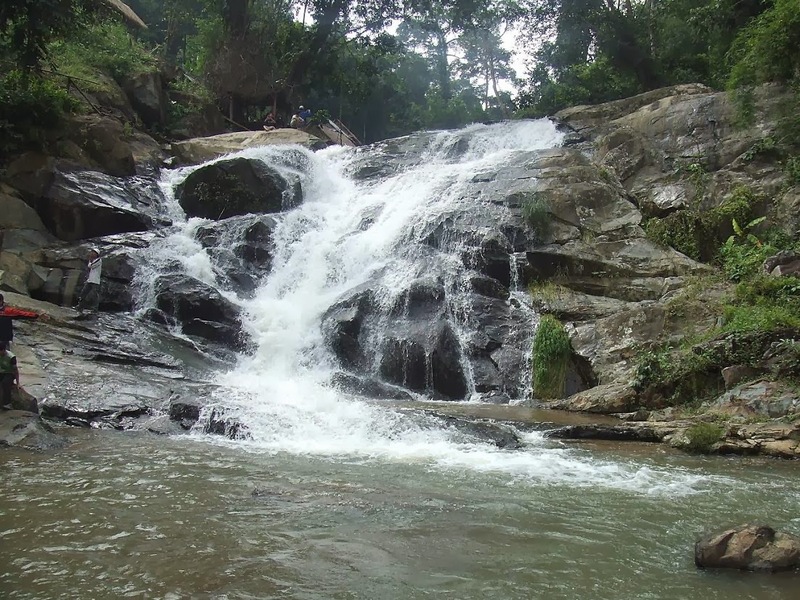 Nowadays, tourists are directed to ‘Phnom Khieu Waterfall’ on the O Tavauv between Phnom Puk and Phnom Krapeu. This is a well-developed tourist site on the road to Battambang, conspicuously marked with a sign with pictures of two waterfalls and an arrow pointing 6.5 km to the south. The road is not bad and leads to an entry gate where a guard sells you a ticket for $1. From the gate it is another kilometer or two uphill to the falls area. There are in fact seven waterfalls along the Tavauv Stream. At each place there are the usual Khmer relaxation places, both high on the bank overlooking the falls and right down along the riverbank. Food and drink are available. The forest setting up in the mountains is idyllic and cool. The trees are marked with both Khmer and scientific names, in case you want to learn what Beng trees look like. I noticed many species of multi-colored forest butterflies along the stream, some of which I had not observed elsewhere in Cambodia. I was the only visitor to the park on this Tuesday, but I was told that on weekends the place is full of picnickers who drive in from Battambang for the day. by Ray Zepp, from the book Around Battambang, published 2006. 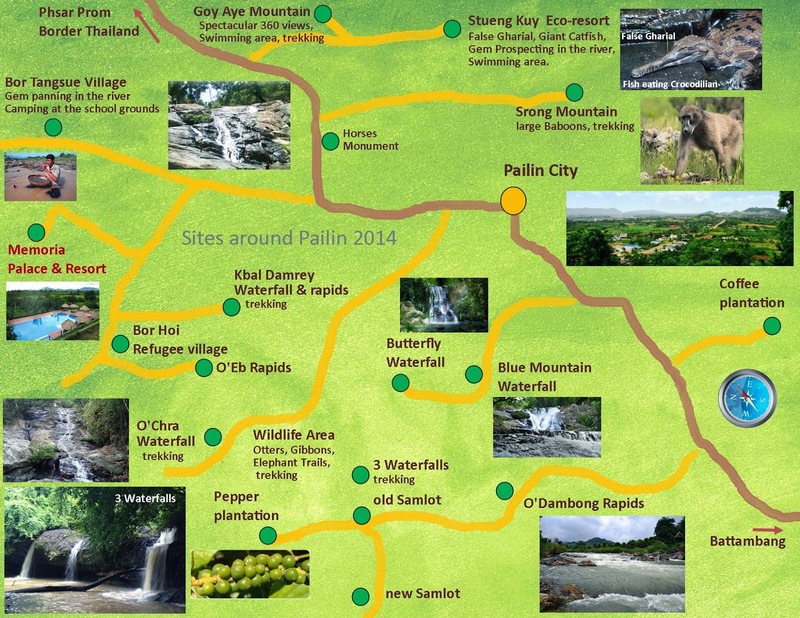 Pailin was originally a small forest zone full of animal and several precious stones. Pailin is the transform word from the original Pan Len, referred by a tale about around the 18th or 19th century, there were a group of hunters who chased the wild animals farther and farther until they reached the present-day Pailin where, then, was of jungles of high trees and some fields by the canal which was called small river such as Tong small river. The hunters saw otters that were swimming and they ran away when they saw people. Then, the hunters went to see the place where the otters played together. They saw small bright rocks and everybody took a rock to show their friends and their relatives in their home land. Arriving in the home land, there were residents (it was said they were Kula people in Chanthaburi Province Siam) knew that the rocks were valuable so they took and broke the rocks to polish into gems with good purity. That was why they went to buy gems from the hunters. The hunters knew that it was way of earning a living, they often tried to go to take the rocks from the old place. At that time, Pailin began to be known as the business place. The frequent going and coming from that place made them call Phee Leng due to the playing of the otters that they saw at the first time. But the residents in Siam pronounced Phee as Phai and Leng as Len​​​​​ or Lin with their Siamese sound as Pea Lean. During the control of France of that area, it was written in Latin with the sound and morphology of the words as Phailin. Later the word was shortened as Pailin. In the late 1970s, Pailin was a prosperous town stemming from the extensive gem deposits in the surrounding countryside. 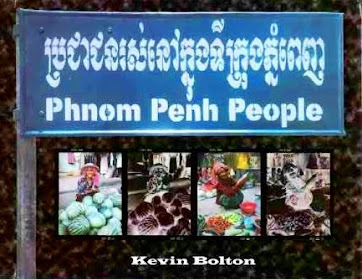 Because of its resources, it was one of the first cities invaded by the Khmer Rouge when they began their major offensive against the national government. The city offered no resistance and the Khmer Rouge soldiers were greeted as liberators as they marched into town. At this point, the deposed king had allied himself with the KR and most residents believed that the KR were fighting to restore him to power. It was not long, though, before most residents were rounded up for a forced march to the countryside to work in rice paddies. Those believed to have connections to the government were killed. The KR used proceeds from mining in the Pailin area to fund their offensive and later their government once they gained national power. When the invading Vietnamese Army threw them from power, they retreated to Pailin, where many former KR leaders remain today. Some leaders went into hiding in fear of punishment for their crimes, although other leaders lived openly in the province. It is said that 70% of the area's older men were fighters for the Khmer Rouge but none of the regular fighters have yet been brought to justice. As of September 2007, Pailin's remaining Khmer Rouge leaders were being rounded up to face justice by an international tribunal, including Khieu Samphan, former Head of State, Nuon Chea, Brother N0. 2, Ieng Sary, former deputy prime minister and minister of Foreign Affairs, and Ieng Thearith, wife of Ieng Sary, former minister of Social Affairs. In the recent years, Pailin suddenly meet the decline of Economy and Business. However, a new wave of tourism began found depend on its ancient temple, natural forest, agro-industry, animals and especially the precious stones.